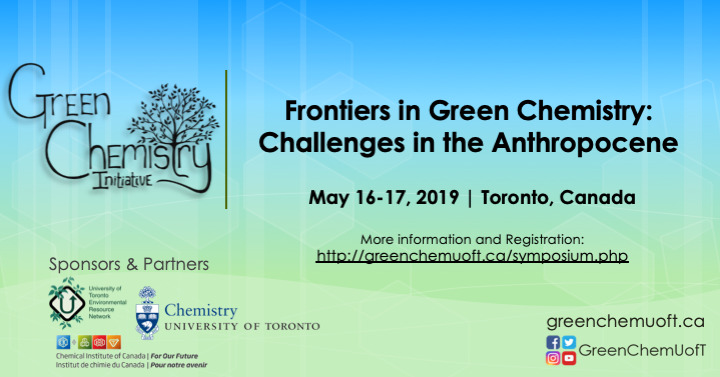 The GCI is proud to announce our 2019 symposium titled "Frontiers in Green Chemistry" Challenges in the Anthropocene" will be held at the University of Toronto on May 16th and 17th. Also included is a crash source on the fundamentals of Green Chemistry. More information can be found here. The Green Chemistry Initiative explains how the choice of inherently safer chemistry can minimize the potential for chemical accidents. Want to catch up on the 2018 GCI Symposium? One of our members, Rachel Hems, wrote a newsletter article for the Chemical Institute of Canada highlighting talks from invited speakers and interactive case studies. Click here to find out more. Are you planning on attending the GCI Symposium but haven't finalized your plans? You are in luck, the Early Bird Registration has been extended to Sunday April 22nd, 2018! Register now here! What is ecocatalysis? I had never heard this term before until reading a recent publication from Grison and coworkers in the RSC journal Green Chemistry entitled “Ecocatalyzed Suzuki cross coupling of heteroaryl compounds”.1 In this work, the authors perform the familiar Suzuki cross-coupling of arylboronic acids (Figure 1) with heteroaryl halides. However, they use a thoroughly unfamiliar palladium catalyst: the common water hyacinth. Continue reading at our blog. For specific details on eligibility and how to apply please visit our Symposium Webpage here and look under "Green Chemistry and Sustainability Travel Scholarships".